Nail polish will always have a special place in my heart. I grew up around it. My Grandmother had a salon and even had her own makeup line (including polish), named after me and my sister. I spent a lot of time at the salon and at her home, playing with makeup. And when we got to spend the night, my Grandmother would give us a special manicure of painted nails with a tiny rhinestone on top--the original accent nail! I remember making my own shades when I was little and coming up with all sorts of nail tips and tricks. I use a lot of them today still! I would mix eye shadow with clear polish, I would draw nail art designs on my school binder, then peel them off and glue to my nails. I would mix glue and polish as a base coat--now common for peel-off glitter polishes. It's no surprise I have over 350 polishes (thanks blogging), including all sorts of gel polishes. Gel polishes are amazing because they last so long on the nails--while traditionally done in a salon, there are many at-home lamp kits. And drugstore brands have gone a step further with no-lamp-needed versions. Plus, they all remove just like regular polish! I've been testing these out over the past couple of years and thought I'd share the best and worst drugstore gel polishes. I will be categorizing them by gel polish, gel top coat, and gel polish kits. I will rate them on shininess (1-3 stars) and on lasting power. I did not review shiny top coats--it had to have "gel" in the title. Overall: I really like the application, color selection, and wear of these. Lasts: 2-4 days. When I first tested this, it lasted and did so well. In the past few times I've worn this, it hasn't lasted long. Overall: Fun to try, but lasts as long as a regular polish. Overall: This gets mixed reviews but I have loved it every time I've tried it. Overall: I was surprised at how well this did for the price. Overall: I tried this with the Essence Gel and didn't really see a difference in lasting time. I liked this. Overall: I saw this on clearance at Target and that should have been my first clue. The colors were streaky and it didn't last at all. Orly has lots of great polishes, including professional gel polishes, but I didn't like this one. Overall: I have used the Sinful Shine in the past and it's okay. But the 2 step with the gel top coat is new to me. I really liked it. Which of these is your fave? Happy St. Pats! Over the weekend I got binge-watched Peaky Blinders on Netflix. It's a BBC show about a gang in the 1920s in Ireland. It's violent, completely unlike what I like to watch, and it is so good. Kind of like Sons of Anarchy in a different time era. Kylie Lip Kit GIVEAWAY--enter here. Instagram only! I've got 2 big giveaways going on: 2 winners for curling irons/wands (so easy) and $300 2 winners to either Sephora or Target. I honestly had no idea that you could do gel nails at home without a lamp. Nail polish chips so easily on my nails I just kind of gave up on it. I'll have to try these out. Thanks! 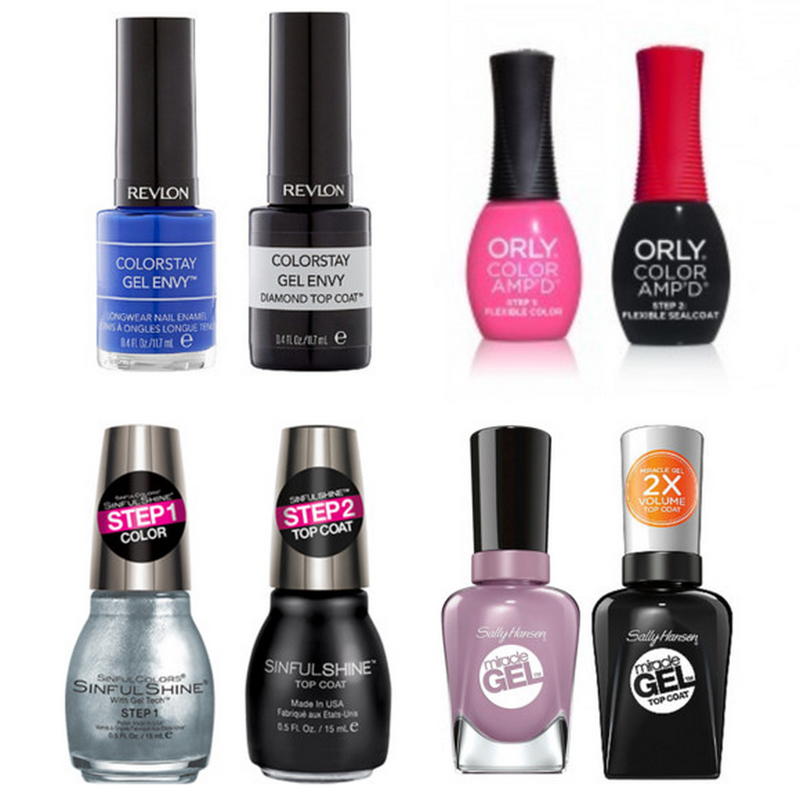 I will have to try out the Covergirl XL and the new Sally Hansen one because I wasn't a huge fan of the old one either! Love Essie gel setter so good! this is great! i have been meaning to try a gel polish from target or a drugstore and haven't been sure which to pick. great review! that sally hansen top coat looks like it'll be in my cart next time. 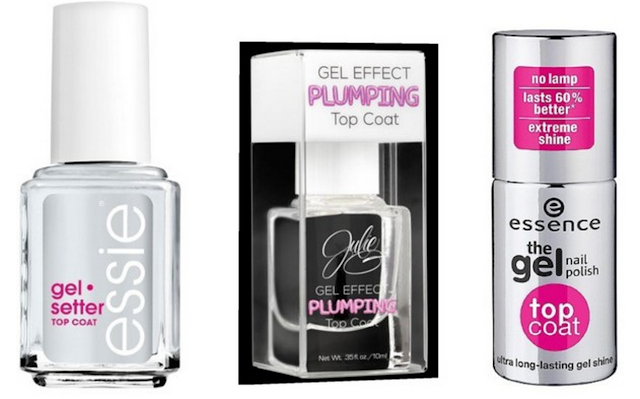 I've never tried gel polishes ever, so this is good list for me, Elle:) Thanks for the reviews. I've only tried Essie and Sally Hanson so far. I didn't like the Sally Hanson top coat at all. It wasn't shiny, but maybe I need to try the new top coat. Essie was ok for me, but no better than any other top coat I tried. I think I need to try the Sinful Colors one next! I plan to pick up Essence gel polish soon, they seems to get pretty good reviews online. I have three of the Wet n Wild nail polish and they last 4-5 days on me but I do use Seche Vite top coat on it. They don't dry down shiny which is why I must use top coat on them. I love this round-up! I've been using the CND polish and loving it, but it is on the expensive side. That's awesome that you found some that last 3-4 days! I'm right there with you when it come to all the polish. I've yet to find ANY type of polish that doesn't chip after 1-2 days. -_- I may have to try that essence brand of gel since I love their colors and they're super cheap! Gel mani's are not in the budget anymore so I will have to pick one of these up on my next target run. I need to check out that show on Netflix, sounds really good! I've only tried the Essie top coat and really liked it. It was glossy and lasted just as long as salon gel nails. I want to try Covergirl XL Nail Gel next. My daughter has the Sally Hansen version so I may have to give it a try. She's 10 and paints nails better than me! Ha! I love the Essie Top Coat, I can go a full week before chipping. The Sally Hansen is pretty good, but the Essie is definitely my favorite. Great gel rundown, lady! I have had much success with the Essie gel top coat- it's my jam! I wish I painted my nails but I don't have the patience because my nails chip so quick! I wish there was a polish that lasted a week + but I know that is only with salon gel manicures usually. I haven't tried gel manicures at home, but my friend swears by them! This definitely gives me a good list to try out when I want to try it at home myself! I'm just curious if these effect your nails the same way a gel manicure from a salon does? My nails are always so brittle afterwards. I feel so out of it but I haven't tried any gel nail polishes or topcoats yet. 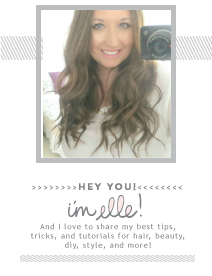 Thanks for sharing your thoughts on all of these Elle! I will have to check out Peaky Blinders; it sounds good! I love how beauty runs through the generations in your family. It is so neat that you have such great memories with your grandma and sister. I remember when I was little my grandma would let me paint her fingers. We must have done a horrible job, but she always acted like we were pampering her! Thanks for the reviews; I think I might try the Essie gel polish when I give myself my next pedicure! I recently used the sinful shine and I agree, I like the top coat. I think it makes a huge difference. I am a finger nail polish junkie and have to have mine painted at all times, so thanks for this awesome guide. It helps! Natalie would want it all. She's into her nails. I can't paint mine because I feel weighed down. I think it's a sensory thing. I remember you talking about how your grandmother's shop before, I think it's really cool how she had a collection named after you and your sister. 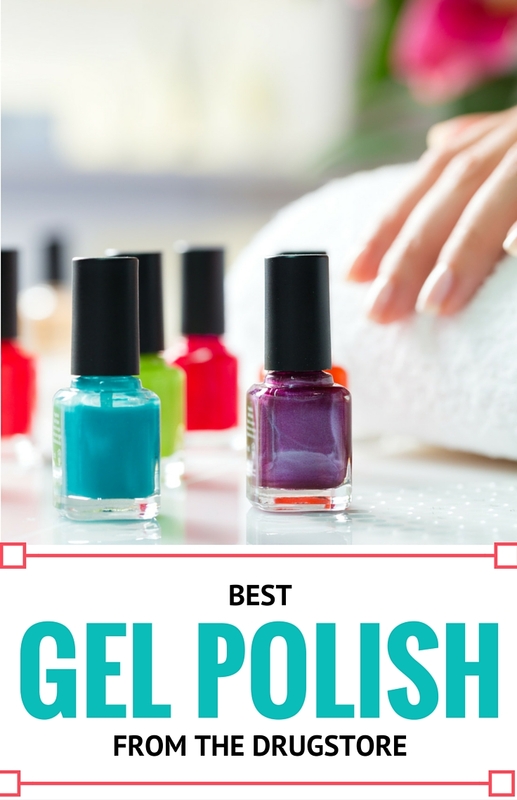 I have tried a few of the polishes you mentioned but none of them really compare to actual gel polish. I do really like the wet n wild 1 step, its not a replacement for gel but it does last me longer then regular polish. Btw they have more then 5 colors because I own 5 and I know their are more. I admit I've been scared to try these, but I have so much trouble with nail polish chipping! I am a tech writer and I swear my nails chip so easily on the keyboard! I will definitely try these now! I thought I had a lot but your nail polish collection puts my collection to shame!! This post is totally after my heart. I'm obsessed with nail polish and have some on at all times. I use the Essie gel topcoat every single time and love it! I love the Essie Gel Setter! It was suggested to me by someone at a nail salon once and I've been using it ever since! 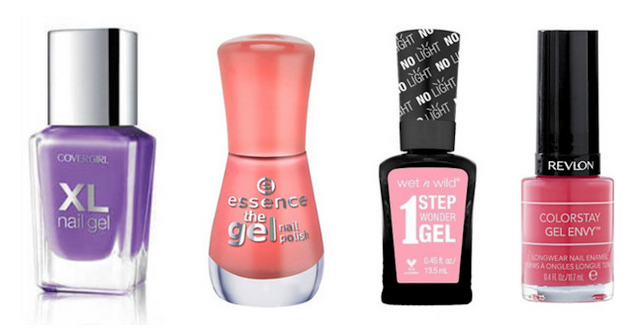 I really like the Sally Hansen one but then I have not tried many other gel ones. So I really cannot compare it to others. Great to hear your view though Elle as I always trust your opinions. 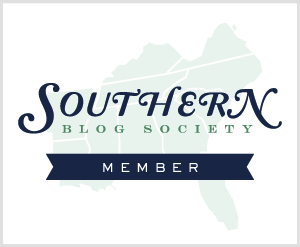 This is a great resource too, thank you for sharing! I'll have to share this with my sister. She has a gel kit with the light and everything at home but has been looking for easy light free gel polishes for when she wants something quick. I love nail polish too but some are better than others. This is super helpful! My biggest question about the gel polishes is how easy is it to take off? I'm intrigued by all the ones you've posted but am hesitant to try gel at home because I hate how taking the polish off destroys my nails. Thats good to know about the new 101 formula! I've never tried a gel manicure, either at home or at a salon. The longer-lasting idea is appealing to me though. I may have to try the CG version though! I have only try the Sally Hansen one. Which I don't care for the fact it doesn't last long. I haven't tried any of these, but I want to check out a couple of the top coats. Glad you reviewed these! That's so awesome that your grandmother had her own makeup line and even named some of the make up after you and your sis! So cool! What was the line called? I will have to try the Essie one, thanks for the in depth review! the only product of those we get in canada is sally hansen and i didnt like it at all. It's good to see that Sinful Colors one had a slightly higher rating from you. That's my favorite brand! I've tired gel nail polish at nail salons, but never at home. I might have to give it a try. This is perfect. Thank you for the break down! I always have good intentions of doing my own nails, but I prefer going to the salon as a treat after a hard week at work to relax a bit and get pampered...! But yet I always buy nail polishes because I like the colors! I'll have to check your favorites out!